One major tip that helps me manage much of my chaos is a little old fashioned; it's a day planner. I use a day planner to help me stay semi sane, it helps me be where I need to be and helps me stay on task. I know I could use my phone but, its not the same. I can't easily write down, plan or look up stuff. Finding the right day planner can also be tricky. I don't like the little check book size ones because they are too small. I'm also too cheap to buy the big huge nice and fancy ones. The Homemaker's Day Planner is perfect for me and my needs. First of all I love how the monthly tabs are separate from the week tab. Why? Simple, I like to use a butterfly clip or paperclip to help me keep my place for the current week. Usually other planners have the month, then each week broken down. So when I open up to this week, but need to look at the month as a whole I have to un-clip and flip to find it. When its separate I can look at each month as a whole to help get quick ideas of what the month is like, or to count if it's the 3rd Wednesday of the month and so on. As a side note I know some people rip out pages when they have passed them, I don't for several reasons. One main reason is it helps me track at the end of year how many dr appointments I went on so I can track mileage and cost for my taxes. Quite often I have to look back to see when I last did something or if I missed something. Hence why I clip to easily get to my current week, but still need all my past pages for reference purposes. The very front of the homemakers day planner has a year breakdown for this year and next year. I love this so when my kids came home in September with dates I needed to remember for next year but I don't have next years day planner yet I can jot it down. Then when I order my next years day planner I can transfer the dates. Plus I can highlight or mark plans for trips or things that I need to keep in the forefront of my mind. I also love how each week has a place for tasks. Sometimes I need to make a list of things that need to happen in general during the week. Like call the dentist, buy a light bulb for the fridge, or take something back to the store. Sometimes I have things that don't need to be scheduled exactly on a certain day, but need to be done in general. I love the menu part of each week too. I usually plan 5ish meals a week and will switch them around during the week, but overall I like to have the week planned for meals. This helps me make sure I have all the ingredients and helps things run more smoothly. Some days we have piano at 4:30, scouts at 6, I have church responsibilities at 7 and my husband is working late. Those days are great for one of my quick meals like grilled cheese and tomato soup. Other days I have nothing scheduled and I can plan a more elaborate time consuming meal. Knowing what my schedule is like, while looking at my grocery store circulars for sale items then writing it down helps lesson the chaos at home. Not to mention this helps save money on groceries or gas money for too many grocery store trips. Less hungry whiny kids plus non-stressed mom plus saving money equals much happier family dinner memories. The back of the day planner has tear out grocery lists. I love this! For instance when I realized I needed a new battery for my fit bit, I wrote it on my list. When my son realized he ran out of cream cheese for his bagels he can add it to the list. This way I don't go to the store 5 times before I remember to buy either items, It's right there for me to see. Its that time of year where my January is already starting to fill up. Kids basketball, husbands work seminars, church functions, school activities are adding up and its time to write them down so I don't forget or over extend myself. 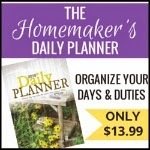 I am using the homemakers daily planner and love it. It saves me so much time knowing what is going on when. Click the picture above or go to http://www.homemakersfriend.com/index.html to purchase yours. Now the next tip is to not loose your planner, because when that happens I feel like I lost my whole brain somewhere!